Bael is an indigenous fruit tree of India. The deciduous tree with trifoliate aromatic leaves is traditionally used as sacred offering by Hindus in India to Lord Shiva. It is commonly planted in temple gardens. 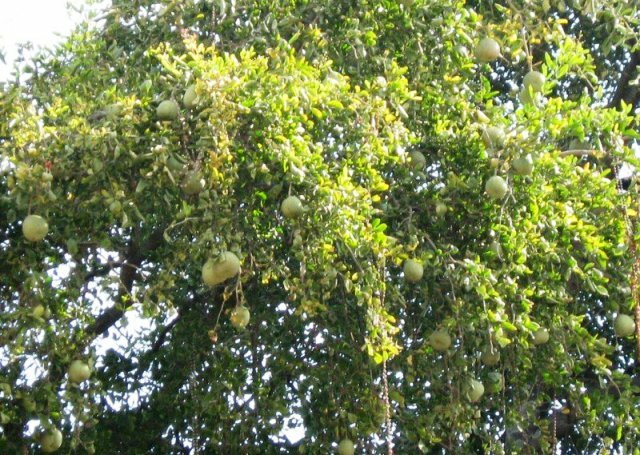 Bael grows wild and semi-wild in the North India states of Uttar Pradesh, Orissa, Bihar, West Bengal and Madhya Pradesh. 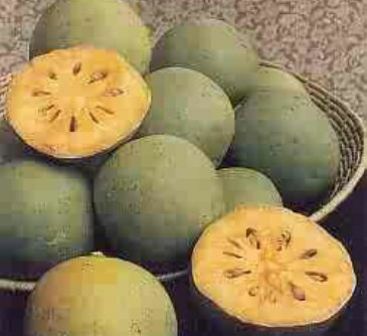 There are no systematic or regular plantation of bael except in Uttar Pradesh . Bael fruit is a hard-shelled berry and very well- known for its medicinal properties due to the presence of marmelosin. Mature fruits are astringent, digestive and stomachic and are usually prescribed for diarrhea and dysentery. The ripe fruit is tonic, restorative, laxative and good for heart and brain. Owing to hardy nature, bael tree has a wide adaptability to adverse soil and climatic conditions. It requires subtropical climate where summer is hot and dry, and winter is mild. However, there is a wild growing strain found in the sub mountainous areas of the North West India which can withstand low temperature even upto -7 C. This strain bears relatively smaller fruits and has been described separately under the title “Wild Himalayan Bael”. A well- drained, sandy loam soil is ideal. It can thrive even on poor, clay and stony soils. It can stand sodicity up to 30 ESP and salinity up to 9ds/m EC. There is no improved cultivar for commercial cultivation. Some popular types named after their locality they are cultivated. 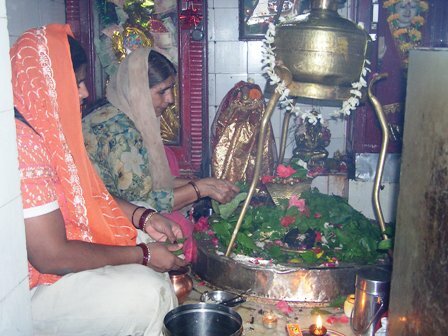 The important among such are Kaghzi Mirzapuri, Kaghzi Gonda, Kagzi Etawah and Kagzi Banarasi. All these type have a thin rind (Kaghzi = paper thin in Hindi) and therefore easier to handle. Recently, some selections such as Narendra Bael 1 with oblong fruits and Narendra Bael 2 with spherical fruits, been found very promising. Bael plants should be planted at a distance of 8m x 8m (Budded plants) or 10m x 10m (seedlings). Pits of 90cm x 90cm x 90cm size are dug and filled with a mixture of top soil + 25 kg farmyard manure and 50 g gamma BHC up to a level of 6 cm from the ground level. Irrigate the pits to let the soil settle down. February-March or July-August is the right time for planting. Young plants are trained with the help of stakes so that they can grow straight. To provide good framewok of the individual tree, the tip of main stem should be removed at a height of about 1m. Select only 4-6 well- spaced branches. Pruning in bael is normally not done. Dead, diseased, weak and crossing branches are pruned off. 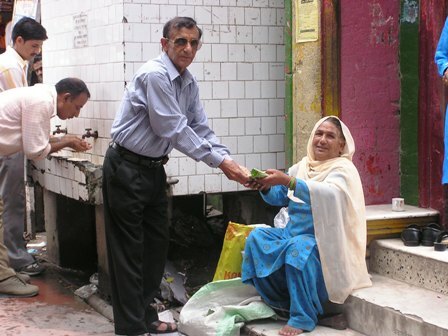 Little or no systematic work has been done on its nutritional requirement. Plant produces a number of fruits hence application of manures and fertilizers is beneficial. Apply 10 kg farm yard manure, 50g N, 25g P and 50gK/ plant to one year old plants. This dose should be increased every year in the same proportion up to the age of 10 years. Farmyard manure should be applied in beginning of May. Half dose of N, full dose of P and half dose of K should be given just before flowering. Remaining half dose of N and K should be given in the last week of August. Manures and fertilizers should be spread under whole canopy of the tree. It should be incorporated well in surface soil. Irrigation should be given immediately after it. Plants need to be cared for watering. Basin system providing more uniform distribution of water should be used for irrigation of young plants. Irrigation to young plantation should be given just after manuring and fertilization. Irrigation at monthly intervals should e given after the rainy season (October –April). Bael plants are most susceptible to water logging, care should be taken to avoid such a condition. Suckers appearing from rootstock should be removed periodically. Keep the plantation weed –free. Legume crops can be taken as intercrops in bael plantation during the rainy season. Since bael is widely used for preserve making, hence mature green fruits are ideal for harvesting. Fruits become fully mature eight months after fruit set. At this stage shell (peel) changes from deep green to light green and flesh (pulp) from light yellow to deep yellow. Ripe fruits, which are to be used for beverage making, should be harvested at ripe stage. Fruits take about11 months after fruit set to ripen on the tree. Tree comes in leaf less condition and fruits are completely exposed. Fruits should be harvested individually from the tree along with a portion of fruit stalk. They should not be allowed to drop or fall an the ground otherwise a minor crack in the shell can cause spoilage during storage. Bearing in budded plants starts 5 years after planting and trees give 100 -150 fruits/tree or 18-20 tons/ha at the age of 10 years . Seedling trees require 8 years to bear fruits, giving 200 -300 fruits/ tree or 20-30 tons/ ha at the age of 12 years. Bael leaves being sold to devotees outside a Shiva temple at Mandi, Himachal Pradesh. spoiled due to fungal infection. Storage life of bael fruits depends on the stage of harvesting. Fruits harvested at full maturity (light green colour) can be stored for about 15 days, whereas those harvested at ripe stage ( greenish – yellow colour ) can be stored only for week. In cool storage, they can be stored for about 3 months at 9 C and 85 -90% relative humidity. Raw or mature green fruits are most suitable for making preserve. Ripe fruits can be processed into quality beverages (ready to serve nectar, squash and cider ), jam, toffee , powder and other products. Fruit drop and cracking in bael before ripening are main problems. Growth regulators, 2, 4-D, GA and 2, 4, 5-T with various concentration check fruit drop to a reasonable extent.. Cracking can be minimized by maintaining proper moisture upto full growth or maturity of fruit. . Chilling injury (appearance of brown spots on the fruit surface) develop during storage of fruits below 9 C.